The Embassy of the Republic of Slovenia in Paris is the official representative body of the Slovene Government in France. The embassy provides consular assistance and promotes bilateral political, economic and cultural relations between Slovenia and the French Republic. The Embassy in Paris is also responsible for Monaco and since September 2012 also for Morocco. In 1993 the Agreement between the Government of the Republic of Slovenia and the Government of the Republic of France on Cooperation in the Fields of Culture, Education, Science and Technology was signed. In December 2011 the Soirée de la Slovénie took place at the urban cultural centre La Bellevilloise in Paris: a documentary photos exhibition (SPP Institute for Promotion of Photography), Slovene short feature films screening (Slovenian Film Centre) and the mercurial Terrafolk concert rounded up a line of events the Embassy organised on the occasion of the 20th anniversary of Slovenia's independence. In May 2011 Slovene and French ministers responsible for culture signed an agreement on cooperation in film production. The agreement clearly defines conditions and ways of cooperation in film production as well as film education and information exchange. Under the new agreement films with 20% Slovenian funding would be eligible for all benefits that French films enjoy. 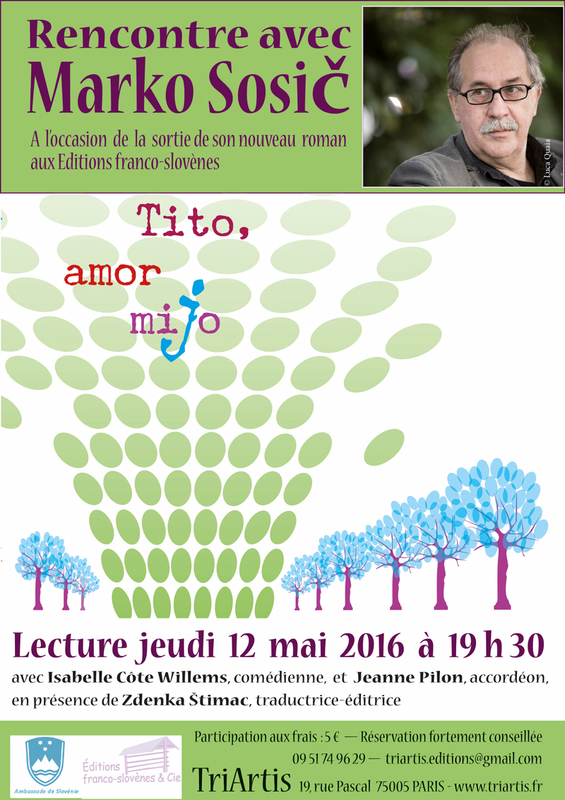 Several literary events have been organised in cooperation with the Antenne Slovène de la Maison de la Poésie, a house of Slovene poetry, which was opened in 2011 in the Centre de Créations pour l’Enfance in the town of Tinqueux near Reims. The centre is run by Mateja Bizjak Petit, a Slovene poet, translator and puppeteer living in France. 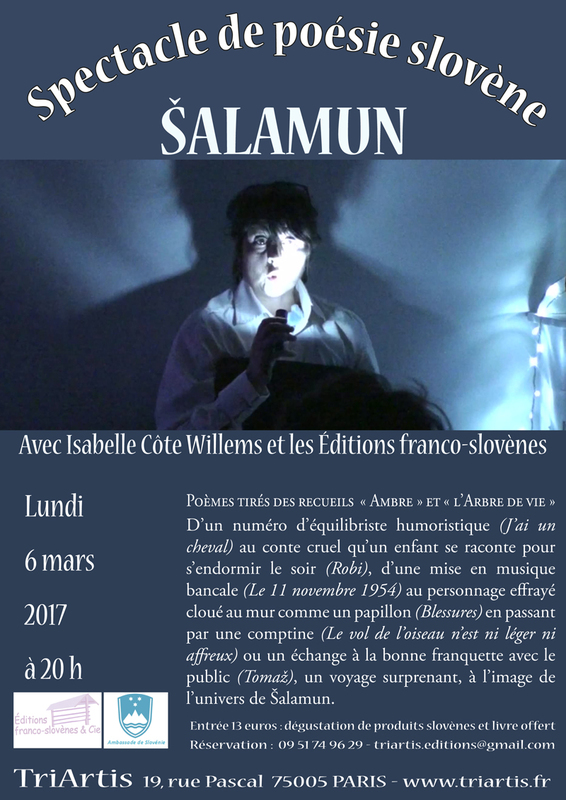 Twelve Slovene contemporary poets of all generations have been featured at the bilingual literary presentations in Tinqueux, Reims and Paris, including the presentations of the poets Aleš Šteger, Katja Perat and the Centre's new publication VA! at the 30e Marché de la Poésie in Paris in June 2012. In March 2012 a tribute to Slovenian and Triestian literature was paid by Boris Pahor, Boris A. Novak, Drago Jančar (the 2011 EU Prize for Literature winner) and the translator of his novels Andrée Lück-Gaye (2011 EU Translation Grant winner) at Translate Europe, 7th European Festival of Literature in Strasbourg, while at the Maison de l’Europe de Paris a Slovene literary evening was co-organised by the Maribor, European Capital of Culture 2012 and the Embassy. This page was last modified on 16 October 2017, at 11:34.